August 2018 Matt McIntosh Features, Production Comments Off on A new rotation? INCORPORATING WINTER CANOLA, SAYS PAGE, ALSO ADDS DIVERSITY TO CROP MANAGEMENT TIMING. AGRICULTURE AND AGRI-FOOD Canada (AAFC) researchers say winter canola can add a lot of value to standard crop rotations. Indeed, they say it can help build soil organic matter, suppress weeds, increase biodiversity, and potentially increase yields in subsequent crops – not to mention being profitable on its own. These benefits, however, are only possible if winter canola is planted and harvested on time, and bookending crops (soybeans specifically) are adjusted for a shorter growing season. Even then, winter canola may not be suitable for every area. According to Dr. Eric Page, research scientist at AAFC’s Harrow Research Station, says producers who follow winter canola with winter wheat should see a bump in wheat yield. Similarly, winter canola followed by a clover cover can support a more vigorous — and hopefully more profitable — corn crop. Incorporating winter canola, says Page, also adds diversity to crop management timing. That and a thick canopy of green cover can help manage herbicide resistance weeds — something particularly important in resistance-ridden Southwestern Ontario — as well as other unwanted plants. “If it comes off early enough you can incorporate other management practices that need to be done, such as tillage,” says Page. Speaking at a field event hosted at the Harrow research station, Page said winter canola should be planted in mid-September. August, he says, is too early. It leaves too much time for biomass to develop, which increases the chance the canola might put up flowers and stems before winter (called “bolting”). This causes winterkill and stand variability in the spring. Planting late, though, can be even more disastrous. October planting does not leave the crop with enough time to establish before the cold strikes. In a harsh winter — such as that experienced in 2017-2018 — winter canola can be virtually wiped out. “Knowing the genetics of purchased hybrids is also important, as winter-spring crosses tend to have a higher chance of bolting compared to strictly winter varieties,” says Page. 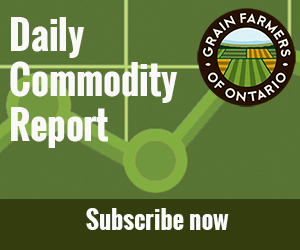 He adds that winter canola is “essentially an alternative to winter wheat.” If soybeans are not ready to come off and the planting deadline for winter Canola has passed, producers can still plant a winter wheat crop. Page says the ideal time to harvest winter canola is generally early July, though that can vary depending on what crop and variety the grower plans to use. Producers looking to follow canola with soybeans will need to use short-season varieties. There are downsides to planting soybeans from lower maturity groups, however. Horst Bohner, soybean specialist with the Ontario Ministry of Agriculture, Food and Rural Affairs, thinks winter canola has a lot of potential when it comes to diversifying standard crop rotations. Yield loss in soybeans planted after canola, though, is a reality farmers must be prepared for. As a general rule, soybean yields drop by one bushel per acre for every day planting is delayed in July. If winter canola isn’t harvested until July 5, for example, that’s a five-bushel drop for soybean varieties which already tend to yield less than their longer-season counterparts — and that’s assuming weather doesn’t delay planting further, or that soil moisture levels are sufficient to spur growth. “If there’s enough moisture in the ground and it’s the fifth of July you have a reasonable chance of a good soy crop,” he says. Canola is also a nutrient-hungry crop, particularly with nitrogen. Indeed, Page recommends applying 200 pounds of nitrogen per acre overall, with about one-fifth of that amount being applied ahead of autumn bolting. Ample amounts of sulphur and boron are also needed — and it all costs money. Bohner adds that oilseed moulds could be an issue if following winter canola with soybeans. Page expresses a similar sentiment, though both say the potential for mould-related issues is likely dependent on farm-specific factors. For his part, Page says he and his colleagues have yet to encounter mould in their research plots. Potential negatives aside, both Page and Bohner think winter canola could be a good rotational fit for some grain farmers. Those in the province’s southwest, in particular, have a better chance of making it work simply due to the (comparatively) longer growing season. However, they reiterate that accessing shorter soybean varieties is critically important in any rotation with winter canola.